For 26 years, Robert Van Ornam has taught junior and senior high school students, and adults how to study the Bible. 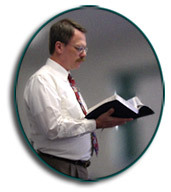 Currently teaching religion at Shenandoah Valley Academy in Virginia, Bob is also frequently asked to preach and to present Tracking God seminars in his area, as well as all across the country. He holds an M.A. in Religion, with a Theology emphasis, from Loma Linda University. He has served as a missionary in South Korea and Kenya, East Africa. In addition to Bible study he enjoys music, photography, travel, nature observation, and a variety of sports. The inspiration for Tracking God came during Bob's missionary service in Kenya. The idea was developed as a result of the many trips he and his family made to the Kenya National Game Park near Nairobi. Always looking for new and interesting glimpses of wildlife, Bob soon realized that finding and observing animals as they really are in the wild took a much different method than just hopping into a Jeep and riding out into the bush. Many times finding a particular type of animal took the work of a detective. The observer had to notice what clues the animals had left behind and then follow those clues to where the animal might be. Clues didn't only come from the animal he was searching for either; sometimes the most important clues came from other animals in the area. By attempting to think like the various animals did in their interaction with their environment and with other animals in their surroundings, Bob was led to observe the animals in situations that revealed their genuine characters. By applying to people and specifically to Bible characters, this idea of tracking and linking clues Bob realized he had discovered a new approach to Bible study.